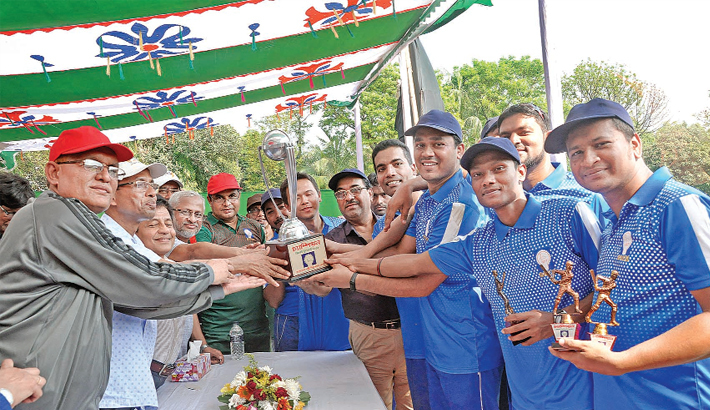 Bangladesh Rural Electrification Board’s (BREB) Sports and Culture Welfare Council Friendly Cricket Tournament was held amid a festive environment at Banani Playground in the capital on Saturday. Oprotirodhyo REB became the champions of the tournament thrashing Odomyo REB by 37 runs in the final of the match. Batting first Oprotirodhyo put up 115 runs losing 2 wickets in the allotted 10 overs and later restricted Odomyo to 78 runs losing 5 wickets in 10 overs. Ogrogami REB and Alokito REB also participated in the four-team tournament. The teams were made up of BREB officials and staffs. BREB senior officials distributed prizes among the winners during the prize giving ceremony. Officials and staff of BREB enjoyed the day-long tournament where all the matches were held in knock-out style.